San Estaban del Rey Mission church, founded in 1629. ON A CHILLY CHRISTMAS EVE just before sunset, my fiancé and I climb to Acoma Pueblo’s Sky City, a spiritual place raised from the valley floor like the Acropolis of Athens. As the day’s last rays warm our faces and glint off the 370-foot bluff, we feel just a bit closer to the gods. The adobe thicket of Sky City and the massive San Esteban del Rey Mission huddle atop the sandstone butte. This ancient citadel that once withstood a Spanish incursion lives on as a bastion of traditional Acoma culture, and this evening, for the first time, we’ve left our respective families to join the families of Acoma. Here, holiday customs blend Native, Hispanic, and Anglo traditions—bowls of warm feast-day stew, homecomings, luminarias, religious rites, and, of course, presents. It’s one of the few times a year, along with the San Esteban Feast Day on September 2, when visitors are welcomed to the mesa-top village without a guided tour. The tour has its merits—history factoids and deadpan tour-guide jokes, like references to the “Acoma National Forest,” a.k.a. Sky City’s single tree. 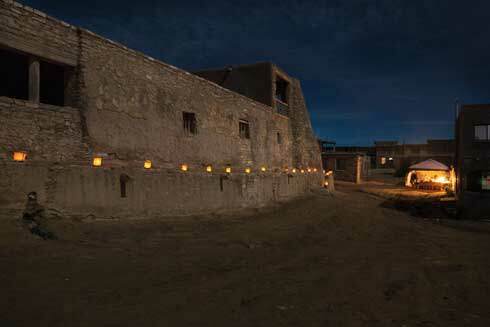 But tonight we relish untethered explorations and freely meander through the pueblo as a living place, not a monument. Strolling the wide lanes between three-story adobe homes and past white kiva ladders, the light musk of piñon smoke from woodstoves catches on the breeze. The 15 families that reside in the village have few modern luxuries—no running water and only generators for electricity, if that—living closer to their ancestors’ way of life than their 2,200 brethren with their modern homes in the community below. Nick and I walk softly, careful not to disrupt the quiet that has fallen as gently as the evening light. The sound of porch doors swinging shut punctuates the silence, then voices rise as family members return to loved ones’ arms in their ancestral homes. Three little girls traipse along the earthen avenue, giggling as they stretch to see over wrapped packages nearly as tall as they are. For a millennium, Acoma people have lived on this land. When their ancestors emerged from that distant point where life began, Earth Mother told them of “a place prepared.” They searched for it, yelling “Haak’u,” until the sound echoed: This was their place, their home. The houses, though, are but 400 years old, rebuilt after Spanish conquistadors under Don Juan de Oñate destroyed the village in 1598. An ageless stairway, sheltered in a bend of rock, had once made the village a nearly impenetrable fortress. With Christmas Eve Mass still six hours away, we descend that staircase, our hands and feet following those of so many others before us on holds worn smooth by centuries of use. 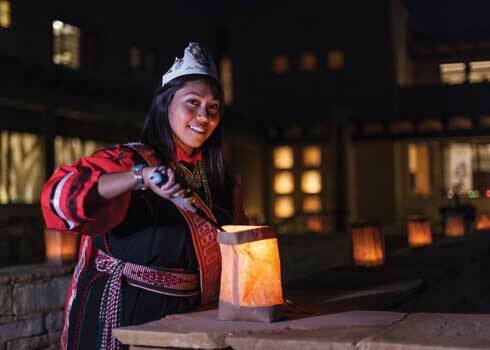 Above: Miss Acoma, Stephanie Riley, at Sky City Cultural Center. At the mesa top, we find the 1629 mission church in all its glory, its thickly buttressed walls and double bell towers bedecked with lights. The bags’ shapes mimic the earthen forms on the walls around the cemetery, which represent soldiers protecting the dead. Tonight the bags illuminate the living as a handful of visitors and the villagers gather in groups, chatting idly and awaiting the bells’ call to worship. At midnight, tribal elders light a bonfire just outside the church grounds, and the bells ring out. Those gathered stream into the church with offerings for the creator—horno bread and intricately painted black-and-white ollas. Inside, candles cast a soft glow on the long church’s interior. Although attendees cluster as though there were a center aisle, no pews disrupt the space. The hundred-foot-long nave leads to a stately wooden altar. On its edge, a twisting red-and-white pattern symbolizes the intertwining of Native and Christian traditions. Most of the year, Catholic Mass is said here; tonight Native rituals prevail. Buffalo dancers enter. They meet on the earthen floor, below magnificent vigas that their ancestors carried from Mount Taylor, 40 miles away. Drumming fills the sanctuary. Dancers shake turquoise rattles. Headdresses bob. Each beat, each step sends prayers of peace and abundance from this centuries-old village to the world beyond. Although the dances continue, as they will on and off for the next few days, our own traditions beckon at home. As we drive east toward Albuquerque, I remember meeting Miss Acoma, Stephanie Riley, at the cultural center. She had the beaming smile and poise of any other pageant winner, but she embodied something much more: a pueblo generation bridging tradition and modernity. A 25-year-old anthropologist, she curates the Haak’u Museum and lauds traditional arts. She learned to make tamale filling from her grandmother, along with the Acoma words for husk, meat, and masa. Her family taught her traditional observances in ways that not only mix cultures but also illuminate, for me, a perfect sense of the Christmas spirit. “As Acomas,” she told me, “we’re taught to pray for everyone in the world. When we’re doing blessings, we acknowledge everyone else first before we acknowledge ourselves.” As the city lights glow on the horizon, I reach for my fiancé’s hand. It’s Christmas morning. —Ashley M. Biggers is a regular contributor to the magazine and author of Eco-Travel New Mexico (University of New Mexico Press, 2017).